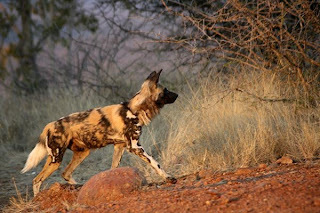 Mira Terra Travel Blog: Madikwe is for the dogs! 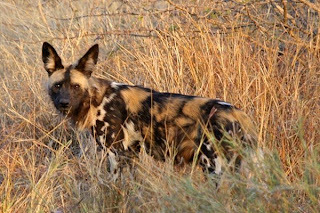 Wild Dogs, that is. 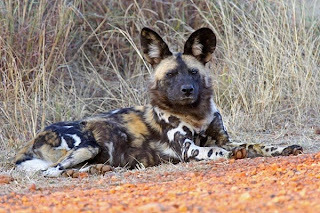 Also known as African Hunting Dogs or Painted Dogs, these are elusive and beautiful canines, and are number one on my personal “Big Five” list for African wildlife photography. Lucky is an understatement. Not only were they out, but they were out in the best hour of daylight. Not only were they out in the best hour of daylight, but they were active. Not only were they active, but they were actively hunting! 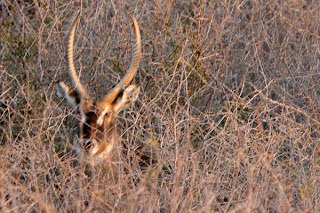 As luck would have it, a lone waterbuck wandered into their territory. Note the "deer in the headlights" stance. As luck would have it, I managed to steady the video camera long enough to capture the scurry of excitement as they gathered the pack together to circle the buck. As luck would have it, for the buck anyway, the rest of the pack were already finishing off their meal from last night's kill, and with bellies full, they had little enthusiasm to join these few. After a feeble attempt to encircle the buck, the 4-5 dogs realized they were outsized by this buck, and allowed it to wander on through. But oh, the excitement to see and hear them ready for a hunt!